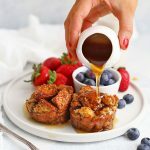 Gluten Free French Toast Cups – Make French toast for a crowd with this easy French toast cups recipe. Perfect for brunches or family meals! Scroll down for the full recipe, flavor variations & the how-to video! These days, I’m often doing more than one thing while I’m cooking dinner, whether that’s practicing spelling words with one child, double-checking math homework, rinsing out lunchboxes, or cooking *with* a child and needing to keep my attention on more than one thing at a time. Because of that, I love a good hands-off recipe. 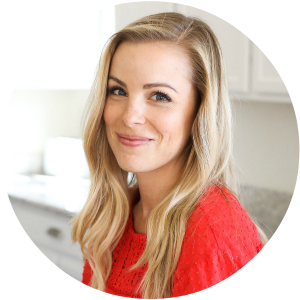 In the same way I want to high-five my slow cooker or Instant pot, or give three cheers for a good one-pan recipe, I love recipes where I don’t have to stand and stir, flip, or monitor them too closely. We’re a big breakfast-for-dinner family, so I’m always looking for ways to enjoy my favorites without too much fuss. So when Sophie requested French toast recently, I started thinking about ways to make it less of a process (you know–dipping, soaking, flipping, soaking, cooking, flipping, repeat). 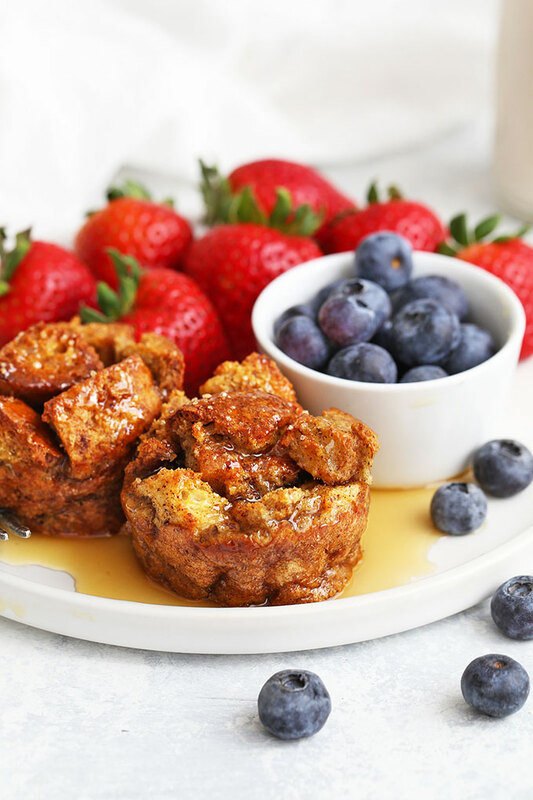 Enter: gluten free French toast cups. They’re all the BEST parts of French toast without all the hands on time–perfect for breakfast, brunch, or breakfast for dinner! They’re made in a single batch – No standing by the stove and flipping! This method takes the guesswork and the repetition out of the process. Instead you mix everything up, let it sit, scoop it into muffin cups, and bake it all at once. No repeating. No flipping. No monitoring. 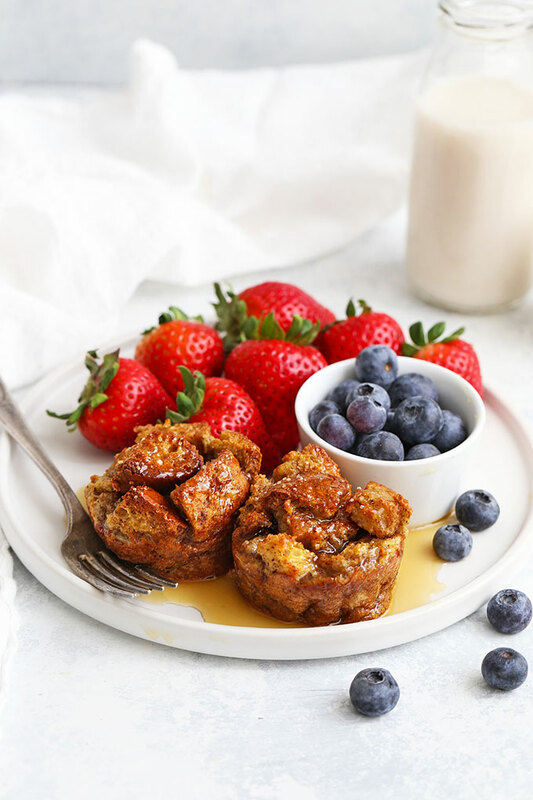 They’re gluten & dairy free (or not) – You can easily make these French toast cups gluten and dairy free like we did, or use traditional wheat-based breads and dairy milk (or any combination of the two!). It’s up to you! Try peaches. Peach French toast cups, anyone? In the summer, you can cut up peaches and use about 1/2 cup diced peaches mixed in with the bread/egg mixture. Serve with additional peaches on the side. Top with cinnamon-sugar. Mix 2 Tbsp sugar (white, brown, coconut–whatever) with 1/2 tsp cinnamon. Sprinkle on top of each French toast cup right before you put the pan in the oven. Sprinkle with coarse sugar – Turbinado sugar (sometimes sold as raw cane sugar or sugar in the raw) is very coarse sugar and creates a really pretty sparkly finish. You only need a tiny bit on top right before they go into the oven. Use chai spices instead of cinnamon. I sometimes use my chai spice mix instead of cinnamon for a yummy twist. The warm spices are so good! Let’s talk muffin pans – I usually LOVE and swear by my nonstick silicone muffin pans because they’re as nonstick as it gets and super easy to clean. That said, I recommend using a metal muffin pan for these if you can because you’ll get a better crispy finish. The edges will brown better and the overall texture works best with a metal pan. What Kind of Milk Can I Use for Dairy Free French Toast? Just about any! My favorites are unsweetened almond and cashew, but you can use whatever you drink (rice, soy, oat, etc.). Not dairy free? You can use cow’s milk without a problem. Not Gluten Free? No worries! 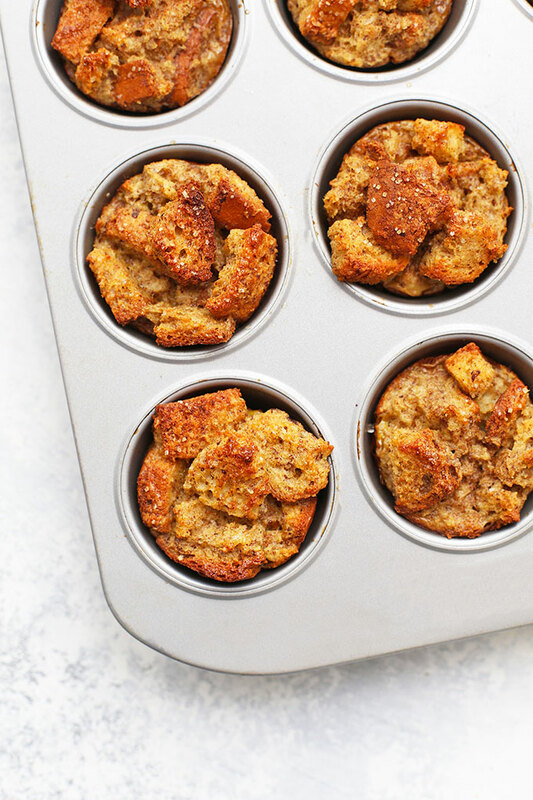 These French toast cups will totally work with wheat-based breads as well. I used to make mine with sourdough or a baguette before going GF. Use whatever you have! Can I Make it Vegan? You can absolutely use vegan bread if you like. However, I haven’t tried this with any kind of egg substitute. Most vegan French toast recipes I’ve seen use some kind of flour or cornstarch to act as a binder instead of eggs. I’m not sure you’d quite get that custardy center or the same puff using just flour or starch, but you might be able to get away with using a powdered egg substitute, like Ener-G or Bob’s Red Mill (follow the directions on the package). Again, I haven’t tested it, but that’s where I’d start if I were going to try. Can these be reheated or is it better to serve fresh? They can absolutely be re-heated! You can do them in the microwave, though they’ll lose their crispy exterior. Otherwise, a toaster oven or the oven are a great option! 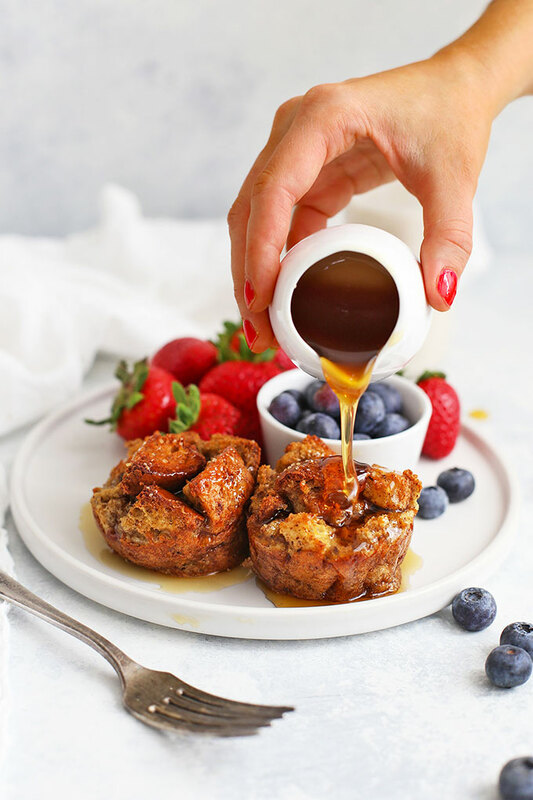 These French toast cups look so yummy, Emily! I cannot wait to try them! THANK YOU Natalie!!! I hope you guys LOVE them! I made these for our Valentine’s breakfast this morning and our whole family loved them!! Thanks for the delicious recipe! In the “FAQ + Tips” section above the video, I have a list of my favorite brands 🙂 We’ve made them using Schar, Canyon Bakehouse, Glutino, and Three Bakers brands with good results. If you want the cubes to stay more defined, Canyon Bakehouse or Schar is your best bet. If you don’t mind a little more softening, Glutino or Three Bakers are a great choice. Hope that helps! Could I freeze them, and then reheat in the oven? can you use instead of egg flax egg? I wouldn’t recommend it (I suggest powdered egg substitutes instead if you need a vegan egg substutyte). I think the flax gets a bit gritty here. That said, if you don’t mind the heartier texture, you could probably get away with it.